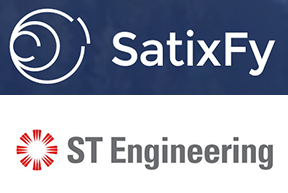 JetTalk, a joint venture between SatixFy UK Limited and ST Engineering, will be showcasing their state-of-the-art In-Flight Connectivity (IFC) satellite Aero terminal, based on SatixFy’s Electronically Steered Multi-beam Antenna Array (ESMA) technology, at the Aircraft Interiors Expo, April 2-4, held at the Hamburg Messe, Germany. Each tile is ESMA based, containing SatixFy’s family of dedicated System on a Chip (SoC) devices. The Beamformer ("Prime") is an industry-new true-time delay chip for pointing and tracking multiple beams from an array of radiating elements. Each element is connected to the RFIC chip (“Beat”) which serves as up and down converter LNA and PA per element. Together, the Prime and Beat create the basis for the ESMA tile. JetTalk is a Joint Venture Company between SatixFy UK Limited and ST Engineering and is developing a satellite antenna system to deliver higher performance with significant cost savings for airline operators, providing enhanced broadband connectivity experience for in-flight passengers.